Many hundreds of virus families are not yet placed under an order, these are not listed here. A virus is a unit of infectious genetic material smaller than any bacteria and embodying properties placing it on the borderline between life and non-life. Viruses routinely infect the cells of both eukaryotes (such as animals, insects, and plants) and prokaryotes (such as bacteria). Viruses comprise genetic material contained within a protective protein shell, a composition that distinguishes viruses from prions (only protein) and viroids (nucleotides of RNA without protein coat). Viruses are obligate intracellular parasites, meaning they can reproduce only by entering a host cell and commandeering its reproductive capacities to reproduce the virus. A virus that infects bacteria is known as a bacteriophage, which is used mainly in its shortened form: phage. Human diseases caused by viral infection include the common cold, the flu, Ebola, chicken pox, and AIDS. While viral diseases are spread by a variety of mechanisms, including insect vectors, that spread is often tied to a failure of human responsibility, such as the failure to practice good hygiene, to exercise sexual discipline, to use insect repellents and mosquito nets, to care for one's body to build up resistance, or even to take vaccines. In some cases, the susceptibility to viruses reflects the need for those individuals and societies with means to help those without means. Viruses are widely dispersed in the oceans, rivers, hot springs, and deep underground. Genes of viral origin, such as the mammalian syncytin gene, which plays a pivotal role in formation of the placenta, are embedded in the genomes of many organisms. This suggests that viruses may have been one of the sources of heritable variability in the course of evolution. Viruses generally are considered non-living as they do not meet all the criteria of the commonly accepted definition of life. Among other factors, viruses do not possess a cell membrane or metabolize on their own. A definitive answer is still elusive due to the fact that some organisms considered to be living exhibit both living and non-living characteristics, as do viruses. The study of viruses is known as virology, and those who study viruses are called virologists. An individual or complete virus particle, known as a virion, is little more than a gene transporter, consisting at the most basic level of nucleic acid surrounded by a protective coat of protein called a capsid. This capsid is composed of proteins encoded by the viral genome and may be either spherical or helical. These proteins are associated with the nucleic acid and are hence better known as nucleoproteins. The combined partnership of nucleoproteins and nucleic acid produce what is known as a nucleocapsid. Both DNA and RNA are found in viral species, but as a rule of thumb, a species will only have one or the other—not both. An exception to this is found in the human cytomegalovirus, which contains both a DNA core and mRNA (messenger RNA). The nucleic acid can be either single-stranded or double-stranded, depending on the species. Therefore, it can be seen that viruses contain all four possible types of nucleic acids: double-stranded DNA, single-stranded DNA, double-stranded RNA, and single-stranded RNA. Animal virus species have been observed to possess all combinations, whereas plant viruses tend to have single-stranded RNA. Bacteriophages tend to have double-stranded DNA. In addition, single- or double-stranded DNA can be either linear or a closed circle. Genome size in terms of the weight of nucleotides varies quite substantially between species. The smallest genomes code for about four proteins and weigh about daltons, while the largest weigh about daltons and code for over 100 proteins. Some virus species possess abnormal nucleotides, such as hydroxymethylcytosine instead of cytosine, as a normal part of their genome. For those viruses with RNA as their nucleic acid, the strands are said to be either positive-sense (also called plus-strand) or negative-sense (also called minus-strand). Positive-sense viral RNA is identical to messenger RNA (mRNA) and can thus be immediately translated by the host cell. Negative-sense viral RNA is complementary to mRNA and thus must be converted to positive-sense RNA by an RNA polymerase before translation. All double-stranded viral RNA genomes and some single-stranded viral RNA genomes are said to be segmented, or divided into separate parts. Each segment may code for one protein and the segments are usually found together in one capsid. Curiously, not all segments are required to be in the same viral particle for the virus to be infectious. In general, four main types of virus shapes can be identified. In all four, a capsid of either helical, icosahedral, or a combination of both is present. Virally coded protein units called protomers will self-assemble to form these capsids. A few viruses do code for proteins that assist the construction of their capsids, but are not themselves integrated into it. Helical capsids are composed of a single type of protomer stacked around a central circumference to form an enclosed tube resembling a spiral staircase. This arrangement results in rod-shaped virions that can be short and rigid, or long and flexible. Long helical particles must be flexible in order to prevent forces snapping the structure. The genetic material is housed on the inside of the tube, protected from the outside. Overall, the length of a helical capsid is related to the length of the nucleic acid contained within it, while the diameter is dependent on the overall length and arrangement of protomers. The well-studied tobacco mosaic virus is a helical virus. Icosahedral capsid symmetry results in a spherical appearance of viruses at low magnification, but consists of capsomers arranged in a regular geometrical pattern, much like a soccer ball, hence they are not truly "spherical." Capsomers are ring shaped structures constructed from five to six copies of protomers. These associate via non-covalent bonding to enclose the viral nucleic acid, though generally less intimately than helical capsids, and may involve one type of protomer or more. Icosahedral architecture was employed by R. Buckminster-Fuller in his geodesic dome, and is the most efficient way of creating an enclosed robust structure from multiple copies of a single protein. The number of proteins required to form a spherical virus capsid is denoted by the "T-number," where 60×t proteins are necessary. In the case of the hepatitis B virus, the T-number is 4, therefore 240 proteins assemble to form the capsid. In addition to a capsid, some viruses are able to hijack a modified form of the plasma membrane surrounding an infected host cell, thus gaining an outer lipid layer known as a viral envelope. This extra membrane is studded with proteins coded for by the viral genome and host genome; however, the lipid membrane itself and any carbohydrates present are entirely host-coded. The viral envelope can give a virion a few distinct advantages over other "naked" virions, such as protection from harmful agents such as enzymes and chemicals. The proteins studded upon it can include glycoproteins, functioning as receptor molecules allowing healthy cells to recognize virions as "friendly," which can facilitate the uptake of the virion into the cell. It should be noted, however, that some viruses are so dependent upon their viral envelope that they fail to function if it is removed. 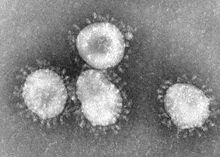 These viruses possess a capsid that is neither purely helical, nor purely icosahedral, and may possess extra structures such as protein tails or a complex outer wall. 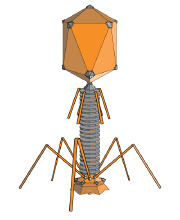 Bacteriophages have a complex structure consisting of an icosahedral head bound to a helical tail via a protein collar, and a hexagonal base plate with many protein tail fibers protruding from it. The poxviruses are large, complex viruses that possess an unusual morphological structure. The viral genome is associated with proteins within a central disk structure known as a nucleoid. The nucleoid is surrounded by a membrane and two lateral bodies of unknown function. Covering the virus is an outer envelope with a thick layer of protein studded on its surface. The whole particle is slightly pleiomorphic and ranges from ovoid to brick shape. Viruses studied so far have diameters of between 10 and 400 nanometers in size. To put that in perspective, a medium sized virion next to a flea would roughly equal the size of a human next to a mountain twice the size of Mount Everest. While most viruses cannot be seen with a light microscope, the largest of them are almost the same size as the smallest bacteria. Both scanning and transmission electron microscopes are commonly employed to visualize virus particles. In taxonomy, the classification of viruses has proved to be rather difficult due to the lack of fossil record and dispute over whether they are living or non-living. They do not fit easily into any of the domains of biological classification and therefore classification begins at the family level. However, the domain name of Acytota has been suggested. This would place viruses on a par with the other domains of Eubacteria, Archaea, and Eukarya. It should be noted that not all families are currently classified into orders, nor all genera classified into families. Some plant viruses are yet to be classified into families. As an example, the chicken pox virus belongs to family Herpesviridae, subfamily Alphaherpesvirinae, and genus Varicellovirus. The general structure is as follows. The International Committee on Taxonomy of Viruses developed the current classification system and put in place guidelines that put a greater weighting on certain virus properties in order to maintain family uniformity. In order, taxonomists should consider the type of nucleic acid present, whether the nucleic acid is single stranded or double stranded, and the presence or absence of an envelope (the lipoprotein sheet that sometimes surrounds the nucleocapsid). After these three main properties, other characteristics can be considered, including the type of host, the capsid shape, immunological properties, and the type of disease it causes. The word is from the Latin virus referring to poison and other noxious things, first appearing in English in 1392. Virulent, from Latin virulentus ("poisonous") dates to 1400. A meaning of "agent that causes infectious disease" is first recorded in 1728, before the discovery of viruses by the Russian-Ukrainian biologist Dmitry Ivanovsky in 1892. The adjective viral dates to 1948. Today, Virus is used to describe the biological viruses discussed above and also as a metaphor for other parasitically-reproducing things, such as memes or computer viruses (since 1972). The neologism virion or viron is used to refer to a single infective viral particle. The English plural form of virus is viruses. The infrequent variations viri and virii, which sometimes appear in Internet communications, are virtually unknown in edited prose, and no major dictionary gives any other form. No plural form appears in the Latin corpus, and the "reconstructed" Latin plural form of viri actually means “men.” The word does not have a traditional Latin plural because its original sense, poison is a mass noun like the English word “furniture,” and, as pointed out above, English use of virus to denote the agent of a disease predates the discovery that these agents are microscopic parasites and thus in principle countable. Naturally this point is extensively argued. Argument continues over whether viruses are truly alive or not. While scientists have no trouble classifying a horse as living, and can see evolutionary relationships between it and other animals, the situation becomes more complicated when they look at simpler things such as viruses, viroids, and prions. Viruses resemble life in that they reproduce, possess nucleic acid, and can respond to their environment in a limited fashion. However, unlike all other forms of established life forms, they do not possess a cell structure, regarded as the basic unit of life. Viruses also suffer an absence in the fossil record, making phylogenic relationships difficult to infer. Additionally, although they reproduce, they do not metabolize on their own, and therefore require a host cell to replicate and synthesize new products. However, confounding this previous statement is the fact that bacterial species such as Rickettsia and Chlamydia, while living organisms, are also unable to reproduce outside of a host cell. Other questions involve the classification of viruses within the evolutionary tree and its implications. If viruses are considered alive, then the criteria specifying life will have been permanently changed, leading scientists to question what the basic pre-requisite of life is. Whether or not other infectious particles, such as viroids and prions, would be next considered as forms of life could logically follow if viruses are considered living. Also, if viruses are considered living then the prospect of creating artificial life is enhanced, or at least the standards required to call something artificially alive are reduced. Small viruses with only a few genes may be runaway stretches of nucleic acid originating from the genome of a living organism. Their genetic material could have been derived from transferable genetic elements such as plasmids (double stranded DNA separate from the chromosomal DNA, such as is common in bacteria), which are prone to moving around, exiting, and entering genomes. Viruses with larger genomes, such as poxviruses, may have once been small cells that acted as parasites on larger host cells. Over time, genes not required by their parasitic lifestyle would have been lost in a streamlining process. Both the bacteria Rickettsia and Chlamydia are living cells, which, like viruses, can only reproduce inside host cells. They lend credence to this hypothesis, as they are likely to have lost genes that enabled them to survive outside a host cell in favor of their parasitic lifestyle. Other infectious particles that are even simpler in structure than viruses include viroids, prions, and satellites (subviral agents, composed of nucleic acids, which depend on viral agents for reproduction in host cell). A new type of virus discovered in 2003 has been named mimivirus, for the term "mimic virus," as it resembles, in some respects, bacteria. The giant virus, over tenfold larger than common viruses, is being examined as a possible link between viruses and "traditional" lifeforms, by way of bacteria. Examples of common human diseases caused by viruses include the common cold, the flu, chicken pox, and cold sores. Serious diseases such as Ebola, AIDS, bird flu, and SARS are all also caused by viruses. The relative ability of viruses to cause disease is described in terms of virulence. In the laboratory, several techniques for growing and detecting viruses exist. Purification of viral particles can be achieved using differential centrifugation, gradient centrifugation, precipitation with ammonium sulphate or ethylene glycol, and removal of cell components from a homogenized cell mixture using organic solvents or enzymes to leave the virus particles in solution. Assays to detect and quantify viruses include:. Hemagglutenation assays, which quantitatively measure how many virus particles are in a solution of red blood cells by the amount of agglutination the viruses cause between them. This occurs as many viruses are able to bind to the surface of one or more red blood cells. Direct counts using an electron microscope. A dilute mixture of virus particles and beads of a known size are sprayed onto a special sheet and examined under high magnification. The virions are counted and the number extrapolated to reach the number of virions in the undiluted mixture. Viral plaque assays involve growing a thin layer of bacterial cells onto a culture dish and adding a dilute mixture of virions onto it. The virions will infect the cells they land on, producing holes in the cell layer known as plaques. The number of plaques can be counted and the number of virions inferred from it. Detection and subsequent isolation of new viruses from patients is a specialized laboratory subject. Normally, it requires the use of large facilities, expensive equipment, and trained specialists such as technicians, molecular biologists, and virologists. Often, this effort is undertaken by state and national governments and shared internationally through organizations like the World Health Organization. A number of highly lethal viral pathogens are members of the Filoviridae. The Filovirus group consists of the Marburg virus, first discovered in 1967 in Marburg, Germany, and Ebola. Filovirus are long, worm-like virus particles that, in large groups, resemble a plate of noodles. In April 2005, the Marburg virus attracted widespread press attention for an outbreak in Angola. Beginning in October 2004 and continuing into 2005, the outbreak was the world's worst epidemic of any kind of hemorrhagic fever. Native American populations were devastated by contagious diseases, particularly smallpox, brought to the Americas by European colonists. It is unclear how many Native Americans were killed by foreign diseases after the arrival of Columbus in the Americas, but the numbers have been estimated to be close to 70 percent of the Indian population . The damage done by this disease may have significantly aided European attempts to displace or conquer the native population. Jared Diamond argued in his book Guns, Germs, and Steel that highly contagious diseases develop in agricultural societies and regularly aid those societies when they expand into the territories of non-agricultural peoples. Because they use the machinery of their host cells to reproduce and reside within them, viruses are difficult to eliminate. The most effective medical approaches to viral diseases so far are vaccinations to provide resistance to infection, and drugs that treat the symptoms of viral infections. Patients often ask for—and general practitioners often prescribe—antibiotics, which are useless against viruses, and their misuse against viral infections is one of the causes of antibiotic resistance in bacteria. That said, sometimes, in life-threatening situations, the prudent course of action is to begin a course of antibiotic treatment while waiting for test results to determine whether the patient's symptoms are caused by a virus or a bacterial infection. Connections between other diseases and certain viruses are currently being studied, such as the connection of Human Herpesvirus Six (HHV6) to neurological diseases such as multiple sclerosis and chronic fatigue syndrome. It has been shown that cervical cancer is partially caused by papillomavirus, representing the first significant evidence in humans for a link between cancer and an infective agent. There is current controversy over whether the borna virus, previously thought of as causing neurological disease in horses, could be responsible for psychiatric illness in humans. Viral populations do not grow through cell division as they are acellular; instead, they must utilize the machinery and metabolism of a host cell to produce multiple copies of themselves. Released virions can be passed from host to host either through direct contact, often via body fluids, or through a vector. In aqueous environments, viruses float free in the water. When the virus has taken over the cell, it immediately causes the host to begin manufacturing the proteins necessary for virus reproduction. Some viruses, like herpes, cause the host to produce three kinds of proteins: early proteins, enzymes used in nucleic acid replication; late proteins, proteins used to construct the virus coat; and lytic proteins, enzymes used to break open the cell for viral exit. The final viral product is assembled spontaneously, that is, the parts are made separately by the host and are joined together by chance. This self-assembly is often aided by molecular chaperones, or proteins made by the host that help the capsid parts come together. The new viruses then leave the cell by either exocytosis (releasing large molecules through the membrane) or by lysis (death of cell by bursting). Envelope-bound animal viruses cause the host's endoplasmic reticulum to make certain proteins, called glycoproteins, which then collect in clumps along the cell membrane. The virus is then discharged from the cell at these exit sites, in the process referred to as exocytosis. On the other hand, bacteriophages lyse the cell to exit. To do this, the phages have a gene that codes for an enzyme called lysozyme, which breaks down the cell wall. A virus can still cause degenerative effects within a cell without causing its death; these are collectively termed cytopathic effects. Bacteriophages infect specific bacteria by binding to surface receptor molecules and entering the cell. Within a short amount of time, sometimes just minutes, bacterial polymerase starts translating viral mRNA into protein. These proteins go on to become either new virions within the cell, helper proteins that help assembly of new virions, or proteins involved in cell lysis. Bacteriophages may have a lytic cycle or a lysogenic cycle. Some viruses are capable of carrying out both. Lysis, as noted above, involves the breakage of the bacterial cell membrane to release the contents of the cell, which in this case also involves the newly assembled bacteriophages. Viral enzymes aid in the breakdown of the cell membrane, and in the case of the T4 phage, in just over twenty minutes after injection over three hundred phages will be released. In the lytic cycle, characteristic of virulent phages such as the T4 phage, host cells will be broken open and suffer death after immediate replication of the virion. As soon as the cell is destroyed the viruses will have to find new host. In contrast, the lysogenic cycle does not result in immediate lysing of the host cell. Instead, the viral genome will integrate with host DNA and replicate along with it. The virus remains dormant, but after the host cell has replicated many times or if environmental conditions permit it, the virus will become active and enter the lytic phase. Interestingly, as the lysogenic cycle allows the host cell to continue to survive and reproduce, the virus is reproduced in all of the cell’s offspring. Animal DNA viruses, such as herpes viruses, enter the host via endocytosis, the process by which cells take in material from the external environment. This frequently occurs after chance collision with an appropriate surface receptor on a cell. 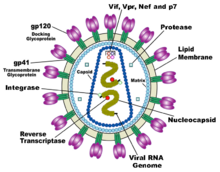 After penetrating the cell, the viral genome is released from the capsid and host polymerases begin transcribing viral mRNA. New virions are assembled and released either by cell lysis or by budding off the cell membrane. Animal RNA viruses can be placed into about four different groups depending on their mode of replication. The polarity of the RNA largely determines the replicative mechanism, as well as whether the genetic material is single-stranded or double-stranded. Some RNA viruses are actually DNA based but use a RNA-intermediate to replicate. Many RNA viruses are heavily dependent upon the enzyme RNA replicase, which is often virally encoded. Viruses are important to the study of molecular and cellular biology as they provide simple systems that can be used to manipulate and investigate the functions of cells. The study and use of viruses have provided valuable information about many aspects of cell biology. For example, viruses have simplified the study of genetics and helped human understanding of the basic mechanisms of molecular genetics, such as DNA replication, transcription, RNA processing, translation, protein transport, and immunology. Geneticists regularly use viruses as vectors to introduce genes into cells that they are studying. This is useful for making the cell produce a foreign substance, or to study the effect of introducing a new gene into the genome. Scientists have been able to use viruses to create metallic wires, and they have the potential to be used for binding to exotic materials, self-assembly, liquid crystals, solar cells, batteries, fuel cells, and other electronics. In the future, they may even be able to act as agents on behalf of bio-mechanical healing devices, giving humans or other animals extended life and more efficient healing processes. The basic idea is to use a virus with a known protein on its surface to bind to a specific material. The location of the gene for this protein is in a known location in the genome, and by randomizing that sequence a phage library of millions of different viruses, each with a different protein expressed on its surface, could be created. One could then find a particular strain of this virus that has a binding affinity for a given material. As an example, a virus that has a high affinity for gold could have gold nanoparticles grown around, resulting in the gold nanoparticles being incorporated into the virus coat. This would produce a gold wire of precise length, diameter, and shape. Virotherapy uses viruses as treatment against various diseases, most commonly as a vector used to specifically target cells and DNA in particular. It shows promising use in the treatment of cancer and in gene therapy. 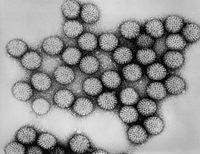 The ability of viruses to cause devastating epidemics in human societies has led to concern that viruses could be used as weapons in biological warfare. Further concern was raised by the successful recreation of the infamous 1918 influenza virus in a laboratory. Much concern revolves around the smallpox virus, which has devastated numerous societies throughout history, and today is extinct in the wild. It now exists in several secure laboratories in the world, and some fear that it may be stolen and used as a weapon. The current global human population has almost no resistance to smallpox; if it were to be released, a massive loss of life could be sustained within a short amount of time. Palese, Peter, Terrence M. Tumpey, and Adolfo Garcia-Sastre. 2006. What Can We Learn from Reconstructing the Extinct 1918 Pandemic Influenza Virus? Immunity 24(2) (February 2006): 121–124. Retrieved September 13, 2016. Sander, S. 2006. All the Virology on the WWW Retrieved September 13, 2016. This page was last modified on 13 September 2016, at 16:57.